At night, March 31, 2016 Father JOHN S. SLEDZIONA, C.M. unexpectedly died at the age of 73 in St. Patrick’s Church Rectory, Pelham, NH. 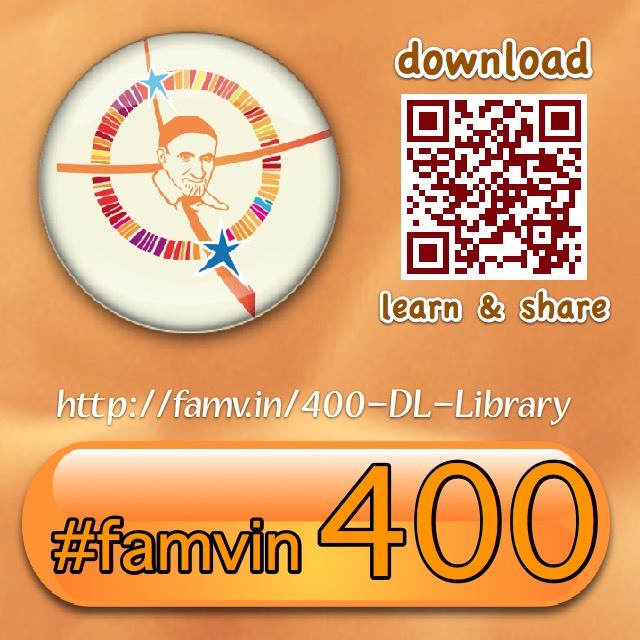 He was a Vincentian for 54 years and priest for 45 years. Recently he was Director of Seminarian Formation and Co-Director of Permanent Deacon Formation for the diocese of Manchester, New Hampshire. 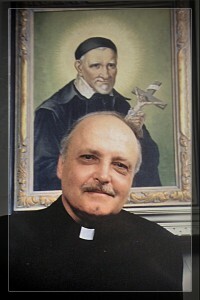 From very first days of his Vincentian priesthood he dedicated his life and vocation into teaching on various levels and taking care of continuing formation of clergy – following the footsteps of St. Vincent de Paul and early Priests of the Mission – either as young priest completing his educational skill, rector of prep school, principal of high school, Provincial Superior, Vocation Director, member of various educational and religious institutions for the Congregation and the Church, devout preacher and missioner. Fr. 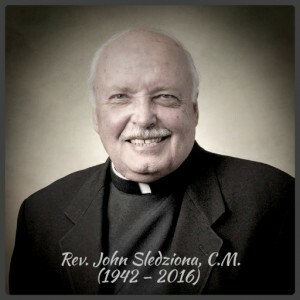 John Sledziona CM was born in St Michael the Archangel parish in Derby, Connecticut. on December 23, 1942 as the son of the late John and Dorothy (Smeider) Sledziona. He attended St. Michael’s parochial school in Derby, CT and graduated from St. Joseph’s Seminary High School in Princeton, NJ in 1960. On June 12, 1962, he entered Congregation of the Mission in then Polish Vice-Province in the USA starting the Internal Seminary Formation in St. Vincent Seminary, Germantown, Penn. On June 13, 1967 he took his perpetual vows. He did his philosophical and theological studies at Vincentian Mary Immaculate Seminary, Northampton, Penn and graduated with Master of Theology (M.Th.) degree. Here John Sledziona was ordained priest on May 30, 1970. Right after ordinations he was assigned to St. John Kanty Prep in Erie, Penn., as religion and English teacher. Meanwhile, in 1973, he graduated from Edinboro State University (of Pennsylvania, Erie, PA) as Master of Arts in English (M.A.) and served in Campus Ministry of Alliance College, Cambridge Springs, PA. In 1976 he was appointed Superior of Erie House (St. John Kanty) and held this position until 1978. Next moved to St. Joseph’s parish, Ansonia, Conn. where Fr. John became first Vocation Director in newly erected Province of New England. When St. John Kanty Prep was closed in June 1980, Fr. Sledziona, together with Fr.Mitchell Wanat and Brother Joseph Zurowski, were sent to Concord, New Hampshire. There, they took over management of the Bishop Brady High School while their residence was in Laboure House, Bow, NH. Earlier, in 1982 Fr. Sledziona became Principal of the Bishop Brady High School. (Fr. Mitchell was chaplain and Bro. Joseph Chairman of English Department) and left the office in 1986. In August 1983 Laboure House was suppressed and Vincentians moved to St Peter’s Rectory in Concord, NH. When Fr. Chester Mrowka CM became Visitor of the New England Province in 1987, Fr. John succeeded him as pastor and superior of St. Peter’s, Concord. In 1987, bishop of Manchester appointed him Dean of Concord Deanery (replaced in 1996). Meanwhile in 1984 – 1996 he was Board Member of Vincentians Studies Institute, DePaul University, Chicago, IL. One of the goals of V.S.I. those days was preparation of English translation of P. Coste’s work on St. Vincent de Paul, his correspondence and other documents. The other was completion of history of Congregation of the Mission in the United States. Father John has conducted many parish retreats and days of recollection, as well as extended retreats for religious women and men. In 1979 to 1981 and again 1987 – 1995 he was Provincial Consultor. He left both posts in Concord after being elected Provincial Superior himself on August 22, 1996, position he held for the next nine years. As fourth Visitor of New England Fr. Sledziona experienced some wins and loses of the Province. The “win-somes” were acceptance of St. Cyril & Methodius Parish in Lower-Greenpoint, Brooklyn. NY and Holy Name of Jesus Parish, Stamford, CT and office of Vicar for Clergy in Maine (Fr. Kuzia). The “lose-somes” were closing of St. Vincent Mission in Utica, NY and the three-in-one parish concept in Lisbon Falls, NY. In August 2005 Father was succeeded by Fr. Roman Gorowski CM as new elected Visitor. As a part of reconfiguration of American Provinces (in 1975 three new provinces were erected enlarging the number to five, including the Province of New England) Superior General has constituted National Conference of Visitors of the United States (NCV) as advisory body to continue interprovincial collaboration (one of the authorities delegated to NCV is moving confreres from apostolates in one province to another). On July 1, 2002 Fr. John Sledziona was appointed first President of NCV for three years period. In February 2006, Father John was appointed Pastor of St. Stanislaus B&M Parish in New Haven, Conn. In October that year, he was elected to the Board of Trustees for Niagara University in Niagara Falls, New York and in the same time began his new assignment as Director of Clergy Formation for the Diocese of Manchester, New Hampshire, which he held until 2013. In April 2007, he was elected to the Editorial Board of the Vincentian Studies Institute. And in January 2008, Father John became a member of the Governing Council for NOCERCC (National Organization for the Continuing Education of the Roman Catholic Clergy.) Since 2006 until he very last moments he has resided at St. Peter’s Rectory, Concord, NH. On September 26, 2013 Fr. John S. Sledziona, C.M. 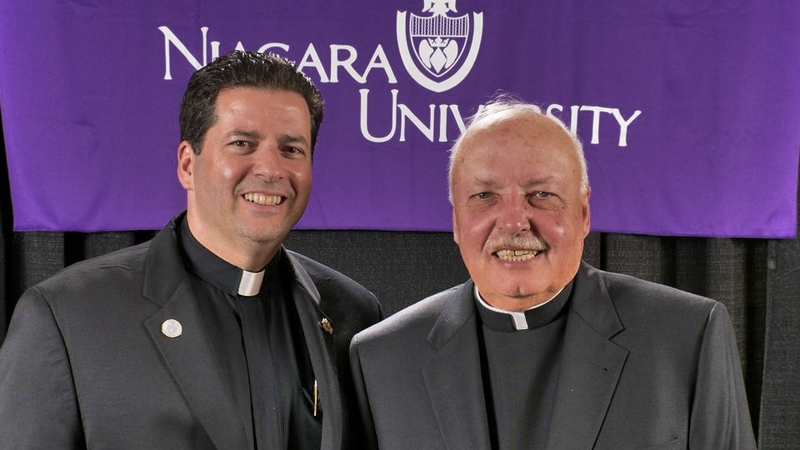 was among four individuals who were honored during Niagara University’s annual Vincentian Heritage Convocation recognized for the extraordinary contributions of university employees, alumni and community leaders. Fr. 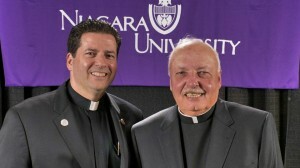 Sledziona, received a honorary Doctor of Humane Letters for his faithful service to Niagara University, the Congregation of the Mission and the Catholic Church. Also in the Fall of 2013 he was assigned to new responsibilities in the diocese of Manchester as cabinet secretary for Ordained Ministry and Liturgical Worship. A year later bishop Libasci of Manchester appointed Fr. Sledziona as Director of Seminarian Formation and Co-Director of Permanent Deacon Formation effective since January 1, 2015. He was at this post until his death. Father John is survived by his brother, Richard Sledziona and a nephew Brian Sledziona. With Faith and Hope in Eternal Life Let us assist him with our prayers! 5 comments to † Father John S. Sledziona, C.M. For many years John was a valued member of the Vincentian Studies Institute representing the New England Province. Beyond this, he was a treasured confrere and colleague. He will be sorely missed. Our deepest sympathies to the confreres of the province and his family. May he rest in peace. I cannot express the gratitude and joy I feel for having known Fr. John since 1971. The bond he made with my family is something we will treasure forever. I have never known a more generous, gracious, kindhearted individual, and I will always cherish the times we spent on the golf course, sitting down to a fine meal together, or celebrating a mass. I take comfort in the fact that he is now at eternal peace with God, and in all the lives his hand has shaped for the better over these many years. Rest easy, my friend. Fr. John’s death is a loss to all of his family, friends and especially to us Vincentians, his confreres. I treasure our collaboration as CM provincials as well as our friendship. We are all better people for having known him. May he rest in God’s peace.